Sometimes it can be very difficult to see God in our chaotic world. The daily rat race distracts us from sensing His presence and providence in our life. 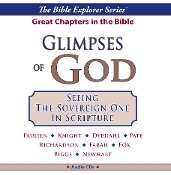 Explore some of the great chapters in the Bible in this unique audio series. You will catch a fresh glimpse of the God who is eager to reveal Himself to you. Explore some of the great chapters in the Bible, verse by verse >> George Knight Ed.D., Jon Paulien Ph.D., Don Pate, Rajah Farah D.Min., Jon Dybdahl, Ph.D., William Richardson Ph.D., and others. 1. Why Is Love So Difficult To Understand? 1 Corinthians 13 >> William Richardson Ph.D.
5. Living With God's Laws Exodus 19 - 20 >> Jon Dybdahl Ph.D.
10. What To Do While Watching And Waiting Matthew 24 - 25 >> George R. Knight Ed.D. 11. Winning With God When The World Ends Revelation 14 >> Jon Paulien Ph.D.
12. The God Of Confident Refugees Psalms 46 and 91 >> Rajah Farah D.Min.